What is a Board Certified Veterinary Dentist? Equine Fellows of the Academy of Veterinary Dentistry. 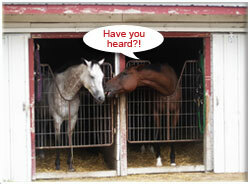 As we know, horses of ALL ages commonly suffer from dental disease. And a healthier mouth means a healthier horse. Do you know anyone whose horse may have poor oral health that could be affecting his performance, appetite or quality of life? Do you know anyone whose horse may be suffering in silent pain from inflamed gums, cheek lacerations or ulcerations? Do you know anyone whose horse may have recently been equilibrated and could benefit from an all natural treatment aid to keep this newly balanced mouth healthier and with less oral bacteria? Do you know anyone whose horse may simply profit from having cleaner gums and teeth? If you do, I'm sure they would really benefit from healthymouth. After all, you know how great healthymouth is for your horse! So, we'd like to give you a chance to introduce them to us. And if you do, we'll be sure to do something wonderful for you and your horse to thank you! For EVERY friend you refer to us, who buys healthymouth, we'll give you a free gallon of equine::hEALTHYMOUTH, a $39.00 value! The more friends you spread the word to about the healthymouth, the more gallons you will continue to receive free of charge. **For phone orders, have you friend let us know that she was referred by you. **For online orders, have your friend fill in your name under the "who referred you" on the order page. Your complimentary gallon will then be sent to you. It's as simple and rewarding as that.